Thu., Dec. 6, 2018, 6:15 a.m.
Spitfire, captured in this photo from Jan. 1, 2018, by local photographer Craig Goodwin, howls in the Lamar Valley in Yellowstone National Park. A gaggle of people caught Craig Goodwin’s eye as he drove through the Lamar Valley nearly a year ago. Goodwin, a Spokane-area nature photographer, stopped. The group was staring at, and photographing, a wolf about 50 yards away. As he joined the group, the wolf walked in his direction. “She stopped right there, she stopped right in the sun, right before the shadows and just howled,” Goodwin said. 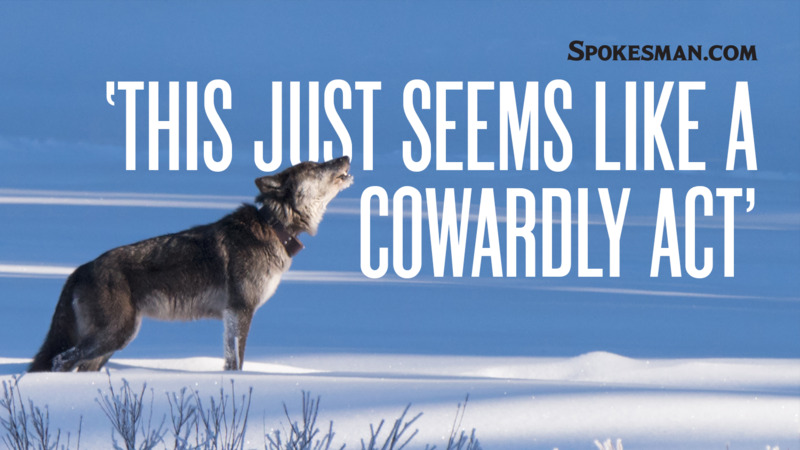 Last week, Goodwin learned that the wolf he’d photographed – 926F, or Spitfire – had been legally killed by a hunter. Many decried the killing while hunters pointed out that the killing was legal. They argue that permitted hunts help control wolf populations and protect elk, deer and livestock. But unlike some, Goodwin’s grief is not because he attributed human traits to the animal. Instead, he thinks humans lost something with the death of 926F. Experiencing the wild can be a humbling and joyous thing, he said. He’s seen his photos inspire and change viewers. The wild, even when mediated through a photo, can make a difference. “With the picture they’re able to experience that a little bit,” he said. “I see the joy people have. And the glee people have. Published: Dec. 6, 2018, 6:15 a.m.